Head to ‘The Sunshine State’ on a family holiday and be blown away by Florida’s warm climate and entertainment hotspots. The family holiday location is home to the theme park capital of the world and is every Disney lover’s dream. 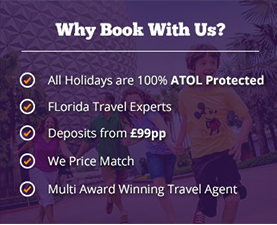 At Holiday Genie we specialise in cheap holidays to Florida and Orlando. Book yours today and, for a limited time only when you buy a 14 Day Walt Disney World Park Ticket, you only pay the price of 7! Theme park capital of the world. Popular choice for family beach holidays. Cosmopolitan City famous for its beach & nightlife. Stay and visit Kennedy Space Centre. Award winning beaches and intimate islands. A chain of islands offering idyllic snorkelling & diving. A holiday in Florida means experiencing warm climate and plenty of sunshine in any month of the year. Known as the Sunshine State, Florida offers countless activities and attractions suitable for the whole family and with its wide range of destinations it’s easy to see why it’s so popular. Whether it’s swimming with dolphins in Discovery Cove, experiencing the thrills of Universal Studios or relaxing with a trip to Disney’s Epcot, there really is something for everyone. Check out the best holiday deals to Florida available right now! As one of the most famous theme park destinations on the planet, Orlando has it all. The blend of Florida sunshine, relaxation, exciting rides and all-round fun makes this the ultimate destination for holidays to Florida. Make your children’s dreams to meet their heroes come true at Walt Disney World Resort, swim with the playful dolphins in Discovery Cove or get your fix of adrenaline at Universal Studios; you can do it all in a holiday to Orlando. It’s not just the theme parks that draw people to the area however; Orlando is also famous for its stunning golf courses, fantastic shopping experiences and excellent restaurants. You needn’t worry about accommodation if you choose to visit Orlando either, as here at Holidaygenie.com we have a great range of hotels and apartments in various locations, including International Drive, Kissimmee, Lake Buena Vista, Disney and Universal. Find out the perfect holiday to this part of Florida with Holiday Genie and save! Clearwater is one of the most popular destinations in Florida for a family-based beach holiday. The area is well known for its compact, unpretentious and family-friendly feel, making it popular with couples and young families alike. The beach itself is located on one of the small islands that dot Florida’s coastline, linked to the mainland by a natural causeway. The Clearwater experience offers more than just the beach too, with popular activities including heading out on one of the region’s dolphin sightseeing trips or visiting the bay’s fascinating marine aquarium. Getting around the island is also easy with its brilliant Beach Trolley: it runs from Clearwater to St Pete Beach with a number of stops in between. Located in the south, Miami has to be one of the Florida’s most famous holiday destinations. It has a name that’s synonymous with beach holidays and offers a great range of year-round activities and entertainment. Miami has a lot of choice when it comes to a holiday: the Art Deco District offers a mix of luxury resorts and boutique hotels; Ocean Drive is known for its see-and-be-seen cafés and excellent entertainment; and Bal Harbour has to be one of the best shopping destinations in the world. This choice is also reflected in the city’s excellent accommodation options, which range from the previously mentioned boutique hotels to smaller, more moderately-priced chain hotels. It is time to enjoy a well deserved holiday to Miami in Florida, don’t you think? For those looking for holidays to Florida that are a little different to the popular theme park-based experiences, a trip to Florida Keys and Key West is a great way to escape to an island paradise. The Keys are formed of 150-miles of interconnected islands, which are joined to the southern tip of Florida by one of America’s most scenic drives: the Overseas Highway. With their mix of nature-based activities and great relaxation opportunities, the Florida Keys make for a great family getaway. Key West is the main town on the Keys and, with its relaxed Caribbean atmosphere and fascinating history, guest are guaranteed a fabulous stay. For those looking for a little more activity, the area has some of the best swimming and diving in Florida, with North America’s only living coral reef located just off the Keys. This is just a taste of all the fantastic Florida holidays you can enjoy - there really is so much more to discover. Whether you’re looking for the fun and thrills of the region’s theme parks or a little rest and relaxation on one of Florida’s many beaches, you’re always welcome in the Sunshine State.